M8 and the Good Pub Guide 2013 - explore the UK’s best pubs! We announced the integration of some pretty cool new app features at the beginning of this year, and so far it would appear that they’re going down pretty well! With a number of features launching at once, we feel we couldn’t do each one justice at the time in telling you guys how good each one is, what they offer and what each can add to your M8 experience. That’s why we’ve decided to give each one centre stage on our blog in the next little while - the first one up is the Good Pub Guide feature! Here at M8 we understand how important the Great British Pub is to the culture of the UK. To locals and tourists alike, pubs play a massively important role in our society and we all agree that a visit to a good pub is almost unbeatable. If you’re looking to experience a slice of local culture, to talk to locals and to get the inside scoop on an area, the best place to head will always be the local pub. Good pubs mean a great number of things to a diverse range of people in the UK. They can exist as places for socialising, or indeed spaces for quiet reflection; they can form the hub of a rural community, or a meeting point for UK city dwellers. During the summer months we can enjoy socialising - if it stops raining - in one of the many pub beer gardens, and warm ourselves in front of open fires when Jack Frost nips throughout winter. Sometimes delicious food is served under the genre ‘Gastro Pub Grub,’ while other fine establishments pride themselves on a no-nonsense menu of pork scratchings and crisps to nibble with drinks. To make sure that our M8 community have access to the best, most highly rated and recommended pubs in the UK, we’ve welcomed aboard our mates at The Good Pub Guide to help you explore and find exactly what kind of pub you’re looking for. Entering its 28th year, The Good Pub Guide remains Britain’s bestselling travel guide and holds core values that we really respect - local knowledge, careful attention to detail, and an independence achieved by focusing on reviews. Showcasing the UK’s best and most loved watering holes, The Good Pub Guide is fully integrated into the M8 app and is available to all M8 app - for iOS, Android and BlackBerry Touch - users through a single purchase. From within M8, you can select the Good Pub Guide widget on the homescreen and use this to search for nearby pubs if you’re desperately parched and need then-and-there refreshment, or you can explore pubs a little further afield by searching by town, county or postcode. You can even search by "worth a visit" and "Top Pubs". If you know what you’re looking for - but you’re just not sure where it is - or you need a little more information you can search for a specific pub by name. We’ve even included "all you need to know" - great for checking out opening hours, awards, live entertainment and that sort of thing. Handy, eh? Containing all of the accurate information held in the latest Good Pub Guide 2013, M8 enables you to access the most comprehensive range of reviews and information - considering the already integrated Trip Advisor, Yelp & Lonely Planet info - to make sure that you make the right decision whether you’re looking for classic country pubs, city-centre inns, riverside retreats, historic hideaways and cutting edge newcomers, gastropubs or even those pubs specialising in malt whisky or craft beers. Cheers! Looking at the information given in The Good Pub Guide, we’re confident that experts Alisdair Aird and Fiona Stapley have it covered when it comes to planning a Sunday roast with the family or a night out with friends; a weekend away or a more lengthy staycation in the UK; or if you’re simply looking for a local pub to have a quiet pint and read your paper in. Here’s what others have said about The Good Pub Guide - high accolade indeed! We’d love to hear about your favourite local pub, oh, and let us know if you find any gems of pubs on your travels - we’ll be chatting about them on Twitter @localm8 and over on the M8 Facebook page! * The Good Pub Guide is available to M8 UK app users as a one off purchase. Off to the GSMA Mobile World Congress (MWC) in Barcelona? We are AND we’ve built a special version of M8 for all you MWC - ers! It’s that time of year again when lots of very cool tech people head to the glorious city of Barcelona to indulge in some of their many passions - mobile technology, culture, fiestas, football, tech merchandise and well, anything else that Barcelona has to offer. Yes, it’s time for the GSMA Mobile World Congress! The city becomes a playground for those with the sought after special entry passes, and we’re going to be there too, making the most of every minute alongside our mates from Telmap! With so much going on over the course of MWC it’s easy to get a bit confused, befuddled and lost amidst all of the excitement. We know - we’ve heard more than a few fantastic stories from past delegates. From failing to find hotels due to dodgy sat nav and directions or getting lost for hours in the Raval while looking for the Sant Antoni metro station, getting trapped by a tourist restaurant and being forced to eat horrendously overpriced and less-than-authentic paella, and even missing out on some of the fabulous Gaudi landmarks just because of nerves surrounding travelling from the MWC central location, there are certainly lots of perils for delegates that can make attending the MWC a less than enjoyable experience. Moving on swiftly...Understanding these challenges as fellow delegates is why we’ve created a version of M8 - available in both English and Spanish - specifically for those of you heading to the Mobile World Congress! Attending GSMA MWC - being held this year at shiny new Fira Gran Via - will be made much easier with this tailor made M8. 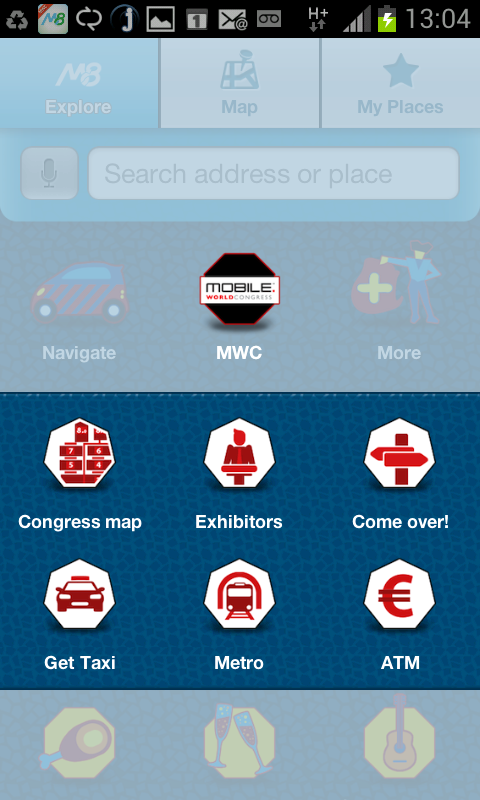 The app - available on iPhone, Android and BlackBerry Touch devices - encourages attendees to explore the Mobile World Congress using their mobile devices, while offering the familiar and much loved M8 user experience. The app will enable you to find local restaurants with reviews and table booking, find hotels and make reservations, bag some nearby special offers, check-in via Facebook, discover the different areas and cultural quarters of Barcelona through the integrated of leading local travel guides, and navigate by car or on foot to wherever you want to go ¿Perfecto, no? 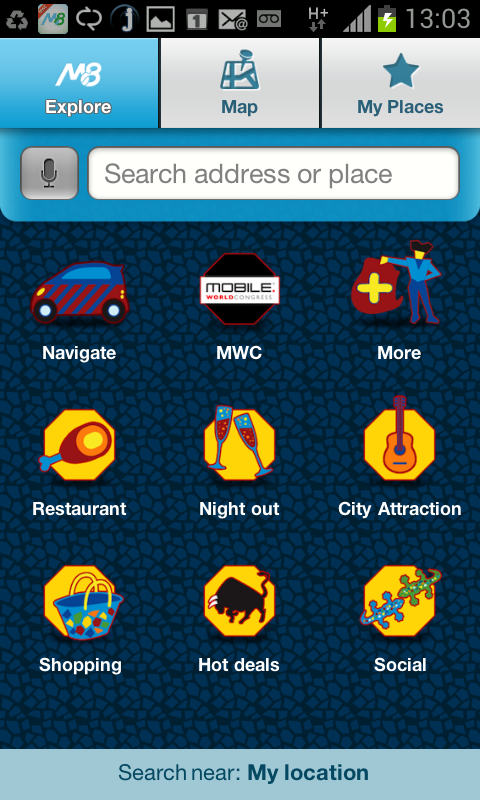 Getting around MWC is going to be easy as pie and we’re including a dedicated MWC widget within the M8 homescreen so you don’t even have to search for it! From this widget, attendees and exhibitors are provided with access to valuable information including an indoor map of the exhibition, a complete directory of all exhibitors, taxis, metro stations and the essential ATM finder. Just as we offer in the UK, we’ve integrated the best local content for those of you attending MWC - well there’s no point including the UK information now, is there?! The dedicated M8 for MWC app is loaded with some of the coolest, most recognized and reliable content providers in Spain. As always, you’ll find us on Twitter @localm8 and on Facebook and we’ll be sure to share everything we get up to while we’re in Barcelona for the MWC! M8 can show you the city! Visiting or living in a city in the UK can be exciting, exhausting, rewarding and chaotic at times. With over 60% of the UK population having adopted a smartphone - whether iPhone, Android or BlackBerry - according to comScore’s figures, we’re fairly sure that a lot of you are using your mobile devices to carry out tasks that help make life in the city that little bit easier or convenient, even more fun or more satisfying! We’ve been talking about urban dwelling and city break holidays for a long time here at M8 HQ, and we believe that the key to making the most of your experience in one of the many fantastic cities within the UK, is getting the inside scoop on the area you’re in - it’s best to become a local, regardless of the length of your stay. Everyone needs a little help to keep their finger on the pulse, whether that’s grabbing a couple of recommendations from friends or getting extra information from sources you trust. M8, your local mate in the UK for iPhone, Android and BlackBerry Touch devices aims to deliver that all-important information or those sought-after recommendations, giving you all the tools you might need to get the most out of your UK experience whether it’s your local community, a holiday spot or business travel destination. From knowing where the best coffee is served to finding out that an amazing Vietnamese restaurant offers 2 for 1 on Pho every Thursday, noticing that there is free parking just a few streets away and being able to support a local independent bookshop rather than spend your well earned cash at a chain, remembering that although the closest cash machine is constantly rammed at lunchtime there’s another that’s always available around the corner, and on those days of sunshine - however rare they may be - there’s a lovely little community garden just minutes away. These are the little things that locals are aware of, and these gems can make all the difference. Usually it takes a bit of time - not to mention a large social circle and a good map - to get to know these nuggets of information and they can be pretty difficult to come by if, for example, you’re in Manchester for the first time for a romantic weekend break. There’s nothing worse than feeling a bit lost and disappointed, and knowing only too well that you’re missing an area’s ‘best bits’. We’re working hard to save you from those awful feelings and bad experiences! We’ve drawn together all of the content and information you will find on Trip Advisor, Lonely Planet, The Good Pub Guide and Michelin travel guide, and integrated it all into our fantastically accurate maps alongside Twitter and Facebook social media communication. With access to all of this information, you’ll never put a foot wrong in a city - or at least, we hope you’ll be saved from rubbish service, from feeling ripped off, or indeed suffering a horrible meal or hideously expensive parking! Sometimes words just aren’t enough so we’ve created this cool animation to demonstrate the ways in which the M8 mobile app can be used as a handy city guide or holiday companion. You may have noticed it on our website, Facebook or Twitter feed, so please let us know what you think!